As with any significant decision in life, no matter how much research you do there is a pretty fair chance that the company and the people you consider doing business with will be more familiar and educated than you are about the nuances, features, benefits, and possibilities associated with the product or industry in question. Assuming that’s true, it’s probably fair to say that your best chance of getting the solution you need and the experience you want will be the result of choosing a home solar panel installation company and team that puts you at ease and is one you can trust. Makes sense, right? But how do you choose? We’ve put together some relatively simple tips and guidelines to help you recognize character traits, level of proficiency and—perhaps most importantly—the underlying motivations of the companies you may be evaluating. Understanding the motivations of each company and what their real goals are, will increase the odds that you’ll choose the company that will give you the greatest results and the best overall experience. Your satisfaction upon completion of a solar project is directly related to the skills, knowledge, experience and professionalism of the company you choose. While some national solar installation companies boast that they have “been in business longer” than whomever or whichever, longevity is irrelevant as it relates to your solar energy project and your home. While it is important to choose a company that can demonstrate a history of proficiency and experience in solar power, the best installer for you is the one who can provide the best of team of professionals that will be working directly with YOU on YOUR project. The easiest way to start the process is by searching websites of companies that serve your area. If you know their names, search for that name or go directly to their site if you know their URL. If you use a search engine for generic solar-terms, you are more likely to see the larger national companies with well-funded marketing budgets at the top of the list. Don’t limit your results to companies listed on page one. Look through the subsequent pages for local names you know or companies that are in a geographic location near you in Connecticut or Long Island, NY. Much of the written copy found on solar websites contain nearly the same information, just arranged in different ways. The method in which this information is organized and presented will provide some insight into the company’s philosophy and how they operate. There are basically two ends in the solar website spectrum: One is company-centric. The other is customer-centric. Company-centric sites are interested in closing the deal, fast. These sites immediately try to capture your contact information and call you to action before they’ve even given you a chance to review their products and services. They also tend to push a specific type of “purchase” option and may not be entirely transparent in presenting all of the options that may be available to you. On the other side of the spectrum, customer-centric sites are informational, educational and present the material from the customer’s point-of-view. They provide information before asking you for yours. These companies emphasize the virtues of solar, how you can save money, and how you can have a positive impact the environment. They explain the technical and financial options in an un-biased way and make it easy for you to contact them when you are ready for more information. Take a good look at the pictures on each website. Look for pictures that are of actual solar panel installation jobs that the company has done in Connecticut and not stock photos. Look for the quality of the work they present. Look at the scope of the work. You can tell a lot about the company’s capabilities and work ethic from pictures of their installations. By knowing these tell-tale signs and how to recognize them, you’ll be able to identify the motives behind the messages. Trust your instincts and choose companies that are not only capable handling the entire scope of the project, but also give you the sense that you’ll feel at ease throughout the entire process. Should you progress to the point where you request a site evaluation of your property, you should expect a full and impartial presentation of ALL of the options available to you and which one best suits your needs. 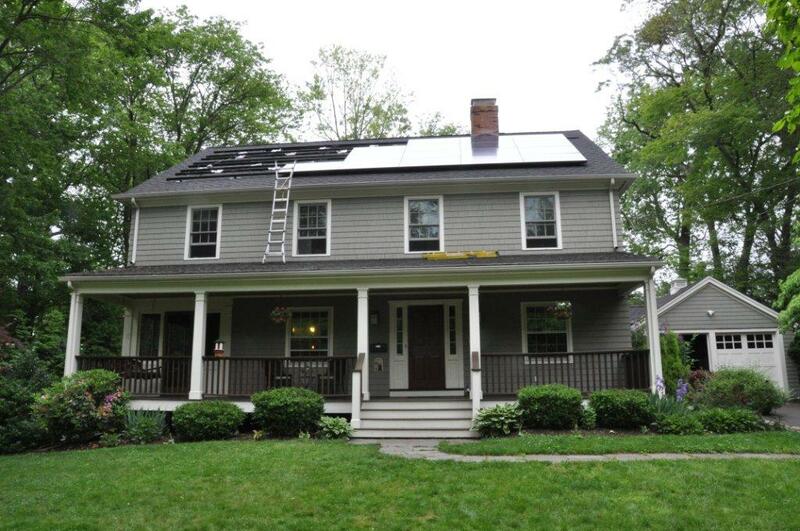 A good home solar company in Connecticut should make you feel comfortable right from the start. Are they prepared to answer your questions? Do they appear helpful and honest? Although all solar companies survive by closing the sale and building the project, your interaction with the company representative should feel more like a consultation versus a sales pitch. Consultants work for the client and try to find the best solution for them. Salespeople can sometimes be conflicted. The majority of the time, the initial contact is via a phone conversation. Some initial Q&A will take place and the representative can, in most cases, discuss the solar possibilities in very broad terms. In order to present you with the most accurate information, they are likely to ask for a recent and complete copy of your electric bill. Once the company has had a chance to analyze it and survey your site via on-line tools, they will schedule a follow-up phone conversation where a more in-depth discussion of possibilities and options will take place. If the solar project features and benefits discussed in the follow-up call sound good to you, a site visit will be scheduled where a detailed, on-site data-gathering exercise will be performed followed by a thorough and comprehensive presentation of the analysis and proposal. Some things to watch out for during this step: Did the solar representative ask you questions to determine what YOUR wants, needs, and expectations are? As the process moved along, did the solar representative listen to your feedback and make any necessary adjustments to better address what’s best for you and your home? Did they try to get you to sign a contract before all of the necessary steps had been completed? Good companies take the time to listen, ask the right questions, and give you an objective assessment of your possibilities. If short cuts are taken while trying to earn your business it should be no surprise if short cuts are taken once you’ve committed to a solar installation project. Good solar companies always perform a thorough site assessment before preparing and presenting a formal proposal. During the solar site assessment visit, roof quality will be assessed, dimensions will be defined, structural components and characteristics are identified, a shading analysis is performed, and electrical service and components are evaluated and cataloged. Each of these steps is critical to a well-designed and well-executed solar project. A good solar company will look at your site objectively and look for solutions that best fit your needs—not theirs. You should still have the feeling that the solar company representative is a consultant, working with your best interests in mind. They should be looking to present the best solution for your unique site conditions, financial situation, and overall expectations for your solar installation. A good solar company uses realistic numbers in their financial analysis of your solar project. The representative should disclose all variables used in the analysis and be able to discuss, in detail, how the results were calculated. For example, an average annual utility rate increase of 3% and an annual system derating factor of 0.5% is normal and customary in CT. A higher rate increase number or a lower derate factor would “artificially” increase your return-on-investment and lower the projected payback period. This could be a sign that the solar company is skewing the analysis to increase the attractiveness of the investment and raise their chances of closing the deal. A good solar company will identify makes and models of all of the major components that are being proposed. They will use high-efficiency, current-model components on their projects or they should disclose why they have chosen not to. They will propose the layout of the system so you know exactly where all hardware will be placed and what the aesthetics will look like upon completion. There should be no “surprises” after the fact. If you do not, at this point in the process, have a thorough understanding of the financial and technical aspects of the proposed solar project, keep asking questions until you are satisfied. If the representative deflects or simply can’t answer your questions about solar power and the specific details of their proposal, it may be a sign that the do not have your best interests at heart. By now you should have the clarity and confidence to make a well informed decision about what is right for you. If it’s a good system design on a reasonable site, then the numbers speak for themselves. Always choose the best value as it relates to your situation, not the best price. If the features, benefits and return-on-investment are attractive, you’ll choose to proceed. If, based on objective and factual information, there isn’t a solution that meets your needs, pass on it, confidently. When you are working with accurate and complete information, you remove doubt and insecurity from the equation. Make sure you are getting quality information from the solar company you are evaluating or, find another company. In a good solar experience, it’s never simply a decision to purchase—it’s an investment decision. It’s a decision made by you and should be totally free of any anxiety. At this stage in the process electrical drawings, site plans, engineering drawings and other information is prepared for submission of building permit and utility interconnection applications. After several weeks, construction begins. The solar installation process is precise and must be done correctly in order to avoid serious problems. A good home solar installation company will not only have teams that fully understand the construction process, they will have team members that take pride in their work, are polite and courteous, and will treat your home like it’s their own. Clean up happens every day. Tools and equipment are stored neatly, every day. The homeowners are inconvenienced as little as possible. Sometimes, one act of carelessness that may seem unimportant to the many is the one thing that a client notices and remembers about the company, the team, and the experience. Good solar companies, with good teams, understand this and make sure their team members know that everything matters in the relationship and the experience. Once construction completed, a building inspection will be completed and the utility company will be notified. Upon approval, the solar power system can finally be turned on. The solar company representative presents an owner’s manual to the homeowner. Contents of the manual are reviewed and the homeowner is given a tour of the system to identify components and their functionality. You can now start to enjoy the benefits of your solar system and, hopefully, if you’ve followed the advice above, you may have actually enjoyed the process. Good luck! Still have questions? Visit our Home Solar Installation page, Frequently Asked Questions page, or Contact Us today. We’re happy to answer any questions you may have!